SCVHistory.com LW3206 | Melody Ranch | Johnny Mack Brown is 'The Sheriff of Medicine Bow' (Monogram 1948). 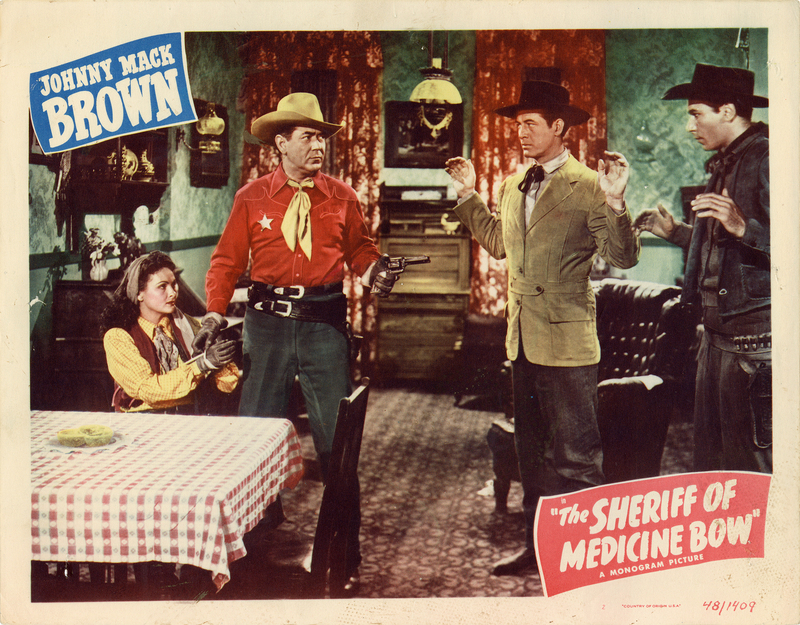 "The Sheriff of Medicine Bow"
Johnny Mack Brown is "Sheriff Johnny" in "The Sheriff of Medicine Bow," a 1948 Monogram "buddy picture" co-starring Raymond Hatton and Max Terhune. Locations include Ernie Hickson's Placeritos (aka Monogram, later Melody) Ranch in Placerita Canyon; the Walker Ranch in Placerita Canyon; and elsewhere in the Newhall-Placerita Canyon area. "The Sheriff of Medicine Bow" is directed by an aging Lambert Hillyer (1889-1969), who directed many William S. Hart films early in his career. Cinematography by Harry Neumann, a Monogram regular. Rounding out the credicted cast are Evelyn Finley, Bill Kennedy, George J. Lewis, Frank LaRue, Peter Perkins, Carol Henry and Bob Woodward. Uncredited cast members are Johnny Carpenter, Herman Hack, George Huggins, Ray Jones, Mathew McCue and Bob McElroy. Carol Henry and Bob Woodward performed their own stunts, along with Whitey Hughes. About buddy pictures: In the 1940s, when the box-office appeal of the big stars of the 1920s and 1930s such as Hoot Gibson and Buck Jones began to fade as their original audiences aged and outgrew them, Monogram producer Scott Dunlap teamed them up in dozens of in low-budget ("B" Western) "buddy pictures" in an attempt to triple the attraction. LW3206: 9600 dpi jpeg from original lobby card purchased 2018 by Leon Worden.